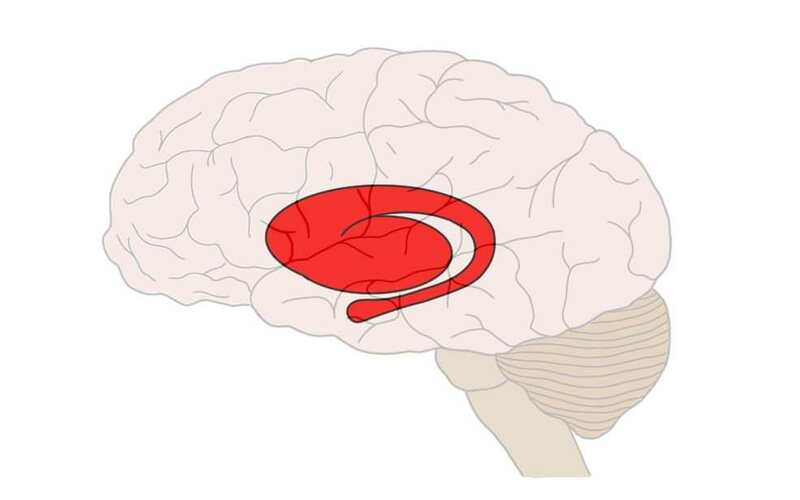 Striatum (in red). The c-shaped portion of the structure is the caudate and the more globular portion is the putamen. The striatum refers to a small group of contiguous subcortical structures: the caudate, putamen, and nucleus accumbens. The caudate and putamen are separated from one another by a white matter tract called the internal capsule, but there are many strands of grey matter that cross the internal capsule between the two structures. The white matter of the internal capsule overlaid with these grey matter "bridges" creates a striped appearance, which is why this area has come to be called the striatum (Latin for striped). The striatum is sometimes conceptualized as being divided into dorsal and ventral sections; the dorsal striatum contains the caudate and putamen, while the ventral striatum contains the nucleus accumbens. What is the striatum and what does it do? The striatum is one of the principal components of the basal ganglia, a group of nuclei that have a variety of functions but are best known for their role in facilitating voluntary movement. The basal ganglia receive information about a desired goal from the cerebral cortex; they help to achieve that goal by selecting the appropriate action for it and initiating movement while at the same time ensuring that oppositional movements are inhibited. The result is smooth, fluid movement. We can see the importance of the basal ganglia in movement by looking at the overt symptoms of someone with Parkinson's disease. These symptoms involve slow movement, tremors, and rigidity, and their severity is associated with the neurodegeneration of basal ganglia nuclei and their connecting pathways. The striatum (primarily the dorsal striatum) is one of the main input areas for the basal ganglia. It receives the bulk of its incoming fibers from the cerebral cortex, but it also receives afferent fibers from the substantia nigra and thalamus. The fibers from the cerebral cortex (i.e. corticostriatal fibers) often carry information about motor plans; these plans are then modified and sent back to the cortex to be put into action. However, it should be noted that the fibers that travel to the striatum from the cortex are not only movement-related. Indeed, the striatum (and more generally the basal ganglia) is thought to be involved in many aspects of cortical function (and thus many aspects of cognition), and so it receives input not just from motor areas but also from areas throughout the cortex. The afferents from the substantia nigra, collectively known as the nigrostriatal pathway, seem to play an especially important role in movement as they are severely affected by neurodegeneration in patients suffering from Parkinson's disease. The role of the fibers from the thalamus, known as thalamostriate fibers, is not very well understood in humans. Fibers that leave the striatum mostly travel to the main output nuclei of the basal ganglia: the globus pallidus and substantia nigra. From there, the fibers extend to the thalamus and other areas; projections from the thalamus carry the information back to the cortex. The ventral striatum contains the nucleus accumbens, a nucleus that has been extensively studied for its role in rewarding experiences. The nucleus accumbens--and the ventral striatum as a whole--is associated with reward, reinforcement, and the progression from just experiencing something rewarding to compulsively seeking it out as part of an addiction. Thus, the ventral striatum is activated when we do--or even just anticipate doing--something we know will be pleasurable. The afferent projections to the ventral striatum come largely from the same places as those of the dorsal striatum (although the ventral striatum seems to get more input from the amygdala and hippocampus). But the involvement of the ventral striatum in reward is most often associated with fibers that travel to the nucleus accumbens from the ventral tegmental area (VTA), a dopamine-rich area in the midbrain. This pathway that travels from the VTA to the nucleus accumbens is called the mesolimbic dopamine pathway. It is activated during rewarding experiences (e.g. during the use of addictive drugs) and therefore is considered a primary component of the reward system. Thus, the striatum is most frequently associated with movement and mediating rewarding experiences. As noted above, however, the striatum is thought to be involved in diverse aspects of cognition and behavior. So, while movement, reward, and motivation may be the most studied of the functions associated with the striatum, they are by no means the extent of them.